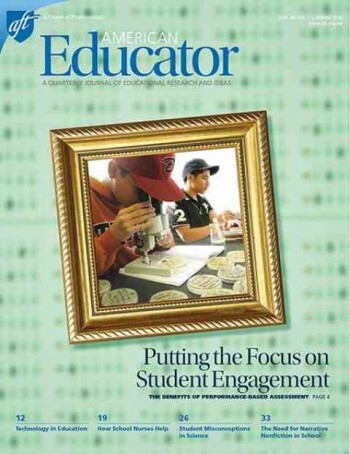 American Educator is the quarterly professional magazine of the American Federation of Teachers. Editors are interested in articles on a wide range of topics, including new trends in education, politics, well-researched news features on current problems in education, education law, professional ethics, and thoughtful or thought-provoking essays that explore current social issues relevant to American society. They also welcome articles on international affairs and labor issues of interest to teachers as AFT members. Editors prefer queries to manuscripts. .Articles may vary in length from 1,000 to 5,000 words, depending on the topic. Avoid overwriting. A well-written article of 1,500 words, for example, has a much better chance of being accepted than a lengthy, rambling story. Pay careful attention to grammar, spelling, and sentence structure. The publication uses the Chicago Manual of Style as stylebook. Authors are paid upon publication. Payment varies according to length and topic. The minimum payment for an article is $300. American Educator purchases all rights to articles (although rights may be returned to author upon request), and the editor reserves the right to edit manuscripts for style, format, and length requirements.